Mumbai, 02 August, 2018: Committed to fostering India’s hip-hop dance scene, Breezer and Only Much Louder (OML) are all set to return with Varun Dhawan and Raftaar as the face of Breezer Vivid Shuffle Season 2. The previous season saw participation of over 1400 dance enthusiasts from 5 cities across the country, bringing the much celebrated popular dance and music culture to centre stage. The festival drove 2.5 million conversations and 5 million YouTube views with some stellar performances in the finale by Divine, Abish and Kenny along with showcases from Kinjaz, BBoy Differ, Marie Poppins and Desi Hoppers. This year’s edition of Breezer Vivid Shuffle promises to showcase a larger pool of the country’s vibrant hip-hop community come together and live life in colour. The pan India competition will comprise of 5 regional rounds and one grand finale. Breakers, Poppers and Crews will get the chance to battle it out across a variety of styles in the regional rounds which will happen in September across 5 cities: Shillong (Sept 2), Delhi (Sept 9), Kolkata (Sept 15), Bengaluru (Sept 16) and Mumbai (Sept 30). This will be followed by a grand finale in Mumbai on the 13th of October. “India’s hip-hop movement continues to brew and with Breezer Vivid Shuffle, we are committed to make it mainstream. In this year’s journey, Varun Dhawan who continues to be a strong pillar of this commitment will be joined by Raftaar as both the passionate artists showcase Breezer’s ethos of ‘Live Life in Colour’”, said Anshuman Goenka, Director Marketing, Bacardi India Pvt. Ltd.
“Breezer Vivid Shuffle has been a thrilling experience. The vibe of the competition has attracted some great performances last year and it’s exciting to see how the hip-hop enthusiasts collaborate, learn and have crazy fun together.” said Varun Dhawan. The competition will consist of four categories in which people can participate based on the dance style: individual categories of one-on-one battles for Popping and B-Boying and group (four or more) categories of Crew Battles and Battle Showcase featuring all styles. The Breezer Vivid music video, to be released shortly, will feature Varun Dhawan as the lead and will be amplified across digital and broadcast channels. 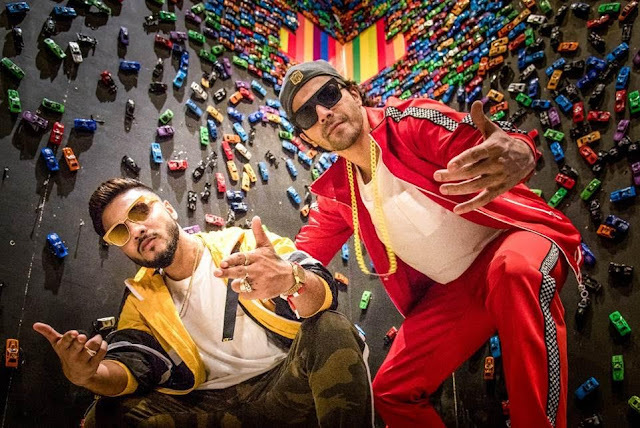 In addition to winning India’s largest cash prize pool at a hip-hop festival, the winners will get a chance to be featured in an exclusive music video with Varun Dhawan and Raftaar. The festival will witness popular hip-hop rappers and DJs perform at cities across India as a run-up to Shuffle and dig deep into the talent pool hidden within India’s upcoming cities, to inspire and inculcate the shuffle vibe. Breezer is a proud globally loved brand from the House of BACARDÍ, the largest privately held spirit’s company in the world, which produces and markets internationally recognised spirits and wines and with over 156 years of experience. Breezer has grown rapidly since being introduced into the Indian Market. Breezer offers the Indian millennial generation convenient colourful coolers in six refreshing flavours: Jamaican Passion, Orange, Cranberry, Blackberry Crush, Lemon Splash and Blueberry. With its colourful outlook on life, the brand strives to inspire its fans to enjoy life and seek ‘fun’ every day and ultimately, ‘Live Life in Colour’. Founded 156 years ago in Santiago de Cuba on February 4, 1862, family-owned BACARDÍ now employs nearly 6,000 people, manufactures its brands at 27 facilities in 16 markets on four continents and sells in more than 150 countries. DRINK RESPONSIBLY. BREEZER IS TRADEMARK OF BACARDÍ & COMPANY LIMITED. Only Much Louder (OML) is a versatile and wide-ranging media and entertainment firm based in Mumbai which produces and promotes some of India's biggest entertainment properties, cutting-edge content and experiences for fans and consumers. With over a decade's experience in live events, artist management, digital and television properties, OML has been an integral part of the burgeoning music, comedy and alternative culture scene in the country. OML produces one of the country's most exciting live music properties-BACARDÍ NH7 Weekender (described by The Guardian as "India's answer to Glastonbury"), a diverse comedy-centric festival-Stage 42, and the flagship creative entrepreneurial gathering-The Coalition. It has promoted and presented tours in India for David Guetta, Enrique Iglesias, Norah Jones, Russell Peters, The Prodigy, Mumford & Sons, Lady Gaga, Eddie Izzard and a number of other artists. In the comedy space, OML has promoted and produced the Russell Peters Notorious World Tour 2013 in India, and AIB Knockout Roast and Royal Turds by All India Bakchod. The artist management division of OML manages some of the biggest independent music and comedy acts in the country. OML works closely with brands to create unique properties and events. This includes shows like news comedy show On Air with AIB on Hotstar, YouTube Comedy Hunt and Laughter Games with YouTube, and MTV Sound Trippin', to name a few.